Angie and I have always been pretty active together. Angie's actually been that way her whole life. If you can name a sport, chances are she's at least tried it or was on a team and competed in it at some point. She's naturally athletic and pretty quickly grasps any physical activity she's confronted with. I was never that big into team sports when I was younger, unless you count band (don't), but started running somewhere around my senior year of high school and kept up with that or some other type of physical activity since then. When Angie and I first started dating we would run or hike together a lot. It was great to spend time doing something active in each others' company. When we got married, we started rock climbing all the time. 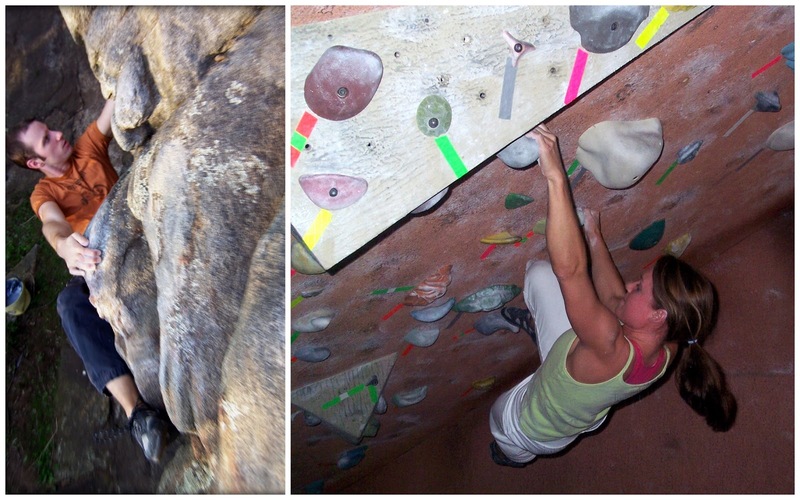 We joined a local indoor gym and would go bouldering at least once a week, if not more. We got pretty good at it and even competed together a few times and took some day trips to go outdoor climbing. Before Angie turned 30, we decided we wanted to run a half marathon so we started training together every day. I've actually always hated running but it was a great excuse to spend more one-on-one time with Angie and have time to talk with no other real distractions. 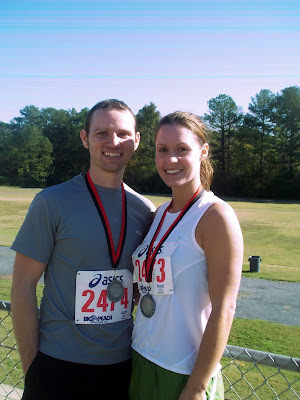 The same month Ang hit the big 3-0, we ran our first half marathon together. What we didn't know when we were running that half marathon was that Angie was actually about two weeks pregnant with Patrick. We went to Vegas the next weekend for Angie's work and when we got back, we found out we'd be having a baby the following July. Since then, our level of exercise hasn't been quite as consistent. We did pretty well after Patrick was born but since having Maddy we haven't been nearly as on the ball. With each child we took the prescribed time off from any physical activity (OK, I know it's only prescribed to Angie but what kind of husband would I be if I didn't suffer along with her? Healthy, you say? Whatever.) and then gave ourselves some time to recover from lack of sleep. Then we were just out of the habit and hadn't quite worked it back into our schedule on a regular basis. This is not a Where's Waldo. We're not in this picture. Don't bother looking for us. But this year we decided to be better about it. Both kids sleep and nap great so we really have no excuses any more. One of the things we did to motivate ourselves was sign up for a couple 5Ks. 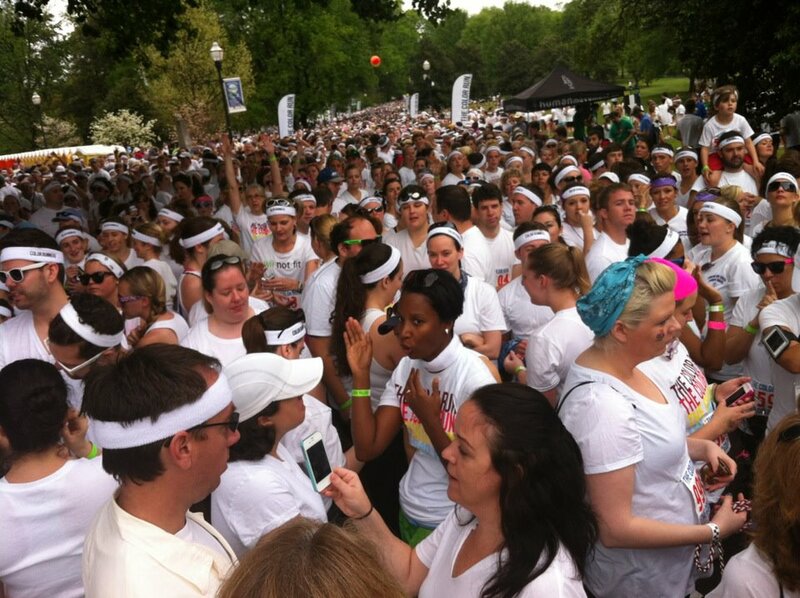 The first one we did was called The Color Run a couple weeks ago. It was for Children's Healthcare of Atlanta (which seemed appropriate since we've had to use them a few times this last year :) ) and was unlike any 5K I've seen. At each kilometer there's a "color station" where a group of volunteers throw colored powder on the runners as they run through. By the end of the race everybody's covered in different colored powder. At the finish line, they basically have a big party and everyone gets a plastic bag filled with a different color powder. Every 15 minutes, everybody pops their color bag and the runners all get doused with powder again. We met up with our friend Natalie, her two sisters and Katie and Brandon. It was really fun and a great first "race" to do to get back into the swing of things. (I only put it in quotes because nobody was actually racing. You'll even notice in the video that we had to walk leading up to the first two color stations because too many people arrived at once.) It was super laid back and all billion people that showed up were just there to have fun. It was also nice to do something like this with Angie again. We decided not to take the kids and I'm actually glad we made that decision. This was no half marathon but it reminded me of when we were first dating and first married and would do this kind of thing a lot. I'm looking forward to doing more. Here's a quick video of some of the race. Fun fact: all the video and pictures were taken with our phones and then I actually made the entire video (title, transitions, music and all) directly from my phone. It was the first time I've tried that but it was perfect for a quick video compilation like this. Love the video! And so glad you brought that run to our attention. We had a blast!! Thanks for organizing and posting about it.